Owning and operating a lawn maintenance business as a family can be incredibly rewarding. It can be a gratifying experience to work alongside your family and to teach your children skills that can benefit them for years and years to come. Being able to build a business from the ground up and do so with the people you care about the most is something that most could only dream of doing. But it comes with its own set of unique issues. Money, power within the business and family disputes can all factor into how easy it will be to transition away from a leadership role and hand over the keys to your kingdom. In the popular book on management, Traction, the author Gino Wickman says that in order for a job to be a good fit for a person and the person to be a good fit for the job, they need to want it, get it, and have the capacity to perform in the role. Mixing family and business can work, but it isn’t the easiest thing to accomplish. 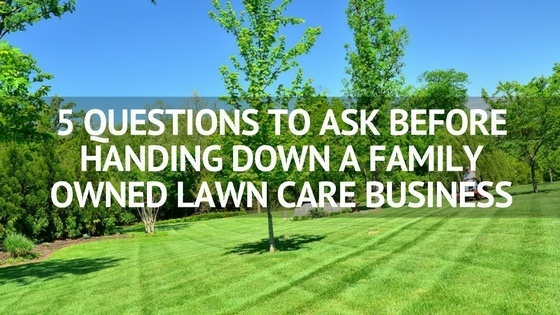 Here are 5 questions to ask when handing down a family lawn care business. You might have the expectation that your children or younger relatives will want to automatically take over the family business after you’re ready to take a step back. You shouldn’t be making assumptions during this step. Like mentioned above, does the person you’re planning on handing the business over to really want it? There need to be candid discussions so there isn’t any grey area. If the person is younger, they may not have had enough experience outside of the family business to make a definitive, informed decision. They might want to try out other jobs, but not realize it until they’re already committed. Also, whether you feel like you are or not, there might be times when a son or daughter might feel pressured into the role. While the family member you’re planning on passing your business down to might want to run it, they might not have the ability to handle it. Have they had a leadership role within the company for a while? How have they performed when given the opportunity to work alone or even manage other people. Again, having candid discussions with your staff will benefit you. Ask your employees what they (honestly) think. Does your son, daughter, nephew, niece or other family member have the necessary skills to run a lawn maintenance business? Have they learned how to mow in the most efficient way possible? Can they run and take care of all the equipment? Do they know what it takes to manage the financial side of the business? You need to ask whether or not they have the skills to do the job. Can they learn what they don’t have? And if they don’t have the skills currently, that doesn’t mean they aren’t still a good fit. There are some people who can pick up skills very quickly. They might have the soft skills but not the hard skills that are necessary for the industry. This is going to be a question that you answer honestly with yourself. You likely know the person well enough to know their learning style to come up with an answer. Can you transition away fully? This is a question that you’ll have to answer for yourself. Will you have the ability to step away fully? Removing yourself from the business can be a tough thing for most people to do. They have spent so much time in their lawn maintenance business that it might be difficult to hand over the keys to the kingdom and step away. One thing that can help you get your ducks in a row is lawn maintenance software. Why not check out FieldCentral?